It is important for seniors to stay active and continue enjoying their hobbies – even after moving into a retirement community. For seniors, gardening can extend far beyond a simple hobby – it can improve the health and happiness of seniors as well. Here at Bethesda, our residents can still reap the benefits of gardening and spending time outdoors. Physical activity –Planting, pruning and watering give seniors moderate daily exercise that can improve their flexibility, coordination, muscle and cardiovascular health, and general physical wellness. Pain reduction –Staying busy in the garden can keep seniors’ minds off their physical aches and pains and keep their minds off their troubles. Being in nature – as well as having something constructive to do with their time – helps reduce stress and promote relaxation. Socialization – Gardening creates necessary social opportunities for both those who tend to the beautiful plants as well as the people who enjoy their beauty. 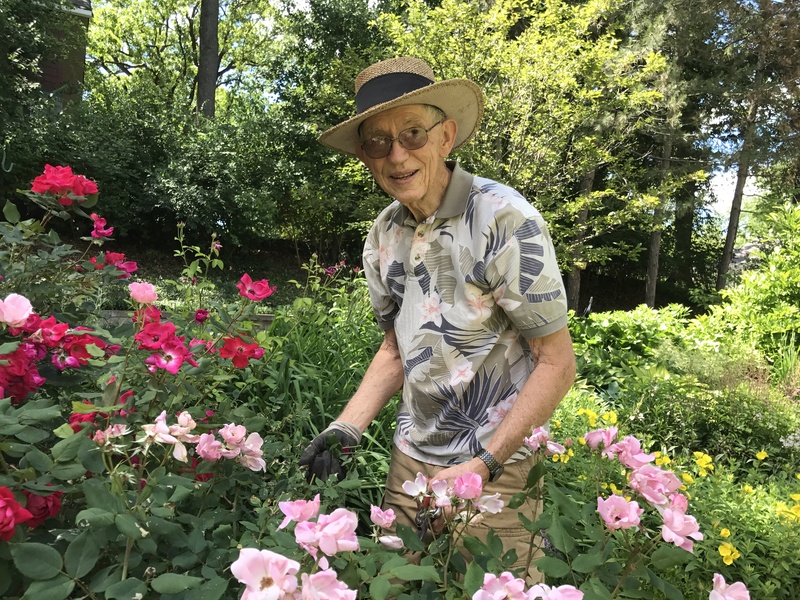 When Bethesda Orchard resident Emil Beier decided four years ago to move from his longtime home into an independent living community in Webster Groves, the only thing he was reluctant to leave behind was his lush backyard garden. For him, planting and pruning was not only exercise. It was a passion. While the responsibility of maintaining a lush, lavish garden might be more than some seniors want to take on, Emil said gardeners are always looking for extra hands to help out. If a senior doesn’t have her or his own garden, they can often find a park, a business or a friend with a garden who would be thrilled to have some volunteer assistance. For example, in addition to his work on the grounds at Bethesda Orchard, Emil volunteers one day a week at the Missouri Botanical Garden. Some seniors may find themselves facing the struggles of aging, such as Arthritis, when trying to keep up with their old hobbies. By getting creative, seniors can still enjoy the benefits of gardening. Emil recommends that seniors who have trouble bending over or getting on their hands and knees practice vertical gardening. By growing plants on a trellis or in elevated pots, they can garden in a physically comfortable position. It is also recommended that senior gardeners work in short sessions (of about one hour) several times a week as opposed to a full day. Be sure to use sunscreen, wear a hat and eye protection, and stay hydrated with plenty of water. While gardening can be great for the mental and physical health of seniors, there are some safety tips to consider before heading for the shed to get their rake and shovel. Don’t overdo it. People are more likely to have an accident when they’re tired and aren’t paying attention. Be careful about overexposure. Heat-related illnesses can sneak up on you. Do a safety check before you start working on your garden. Look for trip hazards such as loose steps, and exposed roots. Make sure garden hoses and extension cords are put away. Remember, sloped ground can be hazardous. Also, avoid ladders and standing on things like overturned buckets to reach tree branches. Carry a cell phone with you whenever possible so you have a way to call for help if there is a problem. At Bethesda, we know that staying interested in hobbies keeps seniors active and happy. Discover more ways that our residents are staying active by contacting one of our Independent Retirement Communities in the St. Louis Area.